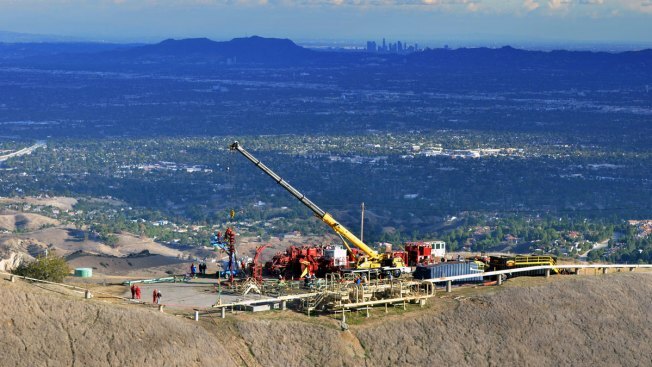 Nov. 3, 2015, file photo, provided by Southern California Gas Co.
A natural gas leak that sickened Los Angeles residents and forced thousands from their homes was the largest known release of climate-changing methane in U.S. history, scientists reported Thursday. The blowout from a well at a Southern California Gas Co. storage facility lasted 16 weeks and spewed 107,000 tons of methane, according to a study published in the journal Science. Methane is a potent greenhouse gas that contributes to global warming. Preliminary figures from the study were previously reported, but the article includes final results and puts the leak in context with other disasters and other sources of global warming. The leak first reported Oct. 23 at the Aliso Canyon storage facility near Porter Ranch released the greenhouse gas equivalent of 572,000 cars in a year, the report said. The total amount of natural gas released was second only to the collapse of an underground storage facility in Moss Bluff, Texas, in 2004, the report said. In that case, methane -- a more potent greenhouse gas than carbon dioxide -- burned off in a fireball so the climate impact wasn't as great, said Stephen Conley, an atmospheric scientist at University of California, Davis, who co-authored the article. "In terms of climate impact, this is the largest," Conley said of the California leak. "If you're specifically looking at that, this is the winner." The total methane released weighed the equivalent of two aircraft carriers and at its peak it discharged enough gas to fill a balloon the size of the Rose Bowl every day. The leak had been gushing nonstop for two weeks when Conley was sent in November by the California Energy Commission to fly his small plane outfitted to measure methane near Porter Ranch. As he took a pass through the invisible plume, he did a double-take at results on a laptop tracking emissions. He was used to flying about a half-mile from a leak and finding methane measurements of 3 parts per million in a big leak and 4 parts per million in a huge one. He was a mile from the leak and the readings were 50 parts per million over the San Fernando Valley. "What the hell is that?" he remembered thinking. "Do I have a problem?" He checked a second instrument and it was no false alarm. 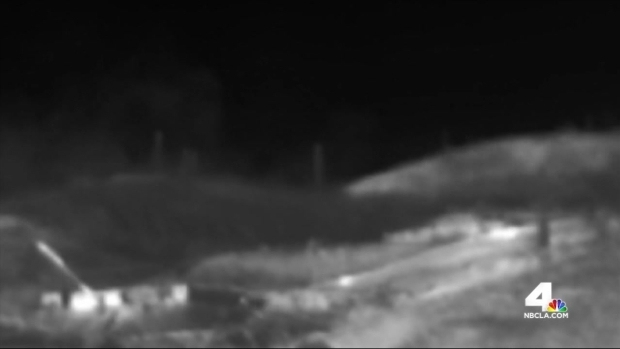 The last time infrared video showed the Porter Ranch gas leak was a month before, but new footage was released Wednesday, showing plumes escaping. Hetty Chang reports for the NBC4 News at 11 on Wednesday, Feb. 10, 2016. "Before we went, no one had any idea the magnitude of it," Conley said. Rob Jackson, an environmental scientist at Stanford University who did not contribute to the study, said it was important to have an independent measure of the emissions. The gas company has not publicly reported how much gas it lost, but said in a Securities and Exchange Commission filing that about 5 billion cubic feet escaped. That is similar to Conley's measurements. The figure is important because the state is drawing up a plan for SoCalGas to mitigate the impact of the methane emissions. On Saturday, utility officials said the leak was permanently sealed. Thousands of families who relocated to temporary housing to get away from the noxious smell received the all-clear to return home. People living in temporary housing with extended leases will have until those leases run out to return home. SoCalGas issued a statement in response to the report. The Southern California Gas Company is facing criminal charges and will be arraigned after the four-month gas leak that happened in the Porter Ranch area. Adrian Arambulo reports for the NBC4 News at Noon on Wednesday, Feb. 17, 2016. "It is important to note that experts agree there are no long-term health effects associated with this event. However, methane is a greenhouse gas, and it is important to put the amount of methane released, as it relates to greenhouse gas emissions, into context. According to measurements conducted by California Air Resources Board, the leak totaled less than 1 percent of California’s total annual greenhouse gas emissions," it read in part.